There was an apparent paradox in the presentations at GWC15. On the one hand there were speakers denouncing PBL (Points, Badges and Leaderboards), putting on an air of disgust when talking about them. On the other hand there were people proudly presenting projects which happily made use of these tools. To make sense of this apparent paradox I want to look at two of the slides that I found most compelling. The first one is of Yu-Kai Chou's octalysis framework, the other of Michael Wu's short-term vs. long-term mechanics. Then I want to relate them to my personal development as a gamification designer and teacher. Octalysis is a gamification method which makes use of 8 core drives. These are neatly arranged in an octagon (Get it? It's wordplay!). Besides being fun and slightly cheesy, this is also very useful, since you can overlay two axes over the octagon. The vertical axis divides the core drives into those focused on the 'left brain' on the left (rational, leaning more towards extrinsic motivation) and the 'right brain' on the right (emotional and creative, leaning more towards intrinsic motivation). The horizontal axis divides the core dives into white hat practices on the top side, and black hat practices on the bottom side. 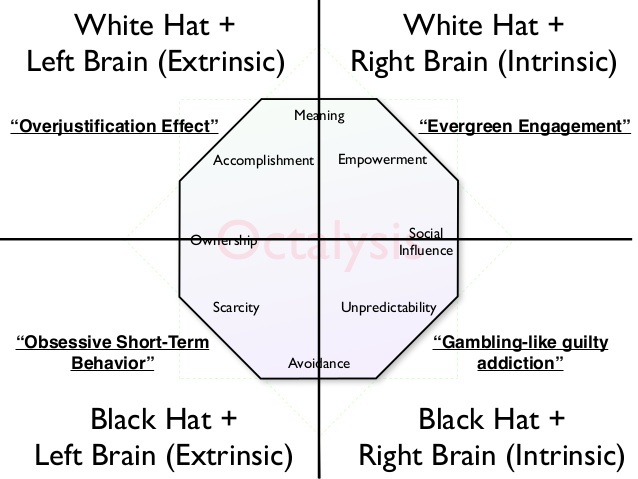 These black hat practices focus on short-term behaviour, often (ab)using our human tendencies towards loss aversion. While these may not feel like fun, they are great in inspiring a sense of urgency. White hat practices focus more on long term behaviour, employing drives like empowerment and meaning. Sadly, while laudable and very effective if used well, they often aren't as good in encouraging people to do stuff right now. For more information on Octalysis, check out Yu-Kai Chou's website, his gwc 15 slides or buy his book. The nice thing about creating two axes is that you get four quadrants as a free bonus. And it is these quadrants that Yu-Kai used to make his point. Points, badges and leaderboards are very much focused on the left brain part of the core drives. Bad PBL mostly operates in the lower bottom quadrant, inspiring obsessive short-term behaviour, but nothing more. Good implementation of PBL is able to make progress visible, and creates a sense of ownership and accomplishment to whatever task the player is doing - it (also) operates in the upper left quadrant. This is what many of the current gamification efforts are aiming at. The problem here is that the player is prone to the over-justification effect: extrinsic rewards such as badges first replace the intrinsic motivation that the player has for doing something. Then they slowly become less valuable due to reward inflation, deteriorating the motivation that they were meant to enhance. This is why Yu-Kai makes the case that gamification should redirect its attention towards the upper-right quadrant - the quadrant of evergreen engagement. In this quadrant are the drives of meaning, empowerment and social influence. Powerful motivators that keep their value in the long term. Keep this in mind as we go visit our second slide of the congress. Michael Wu of Lithium presented his gamification spectrum: a spectrum in which he puts several commonly used gamification mechanics on a feedback timescale ranging from immediate to over a year. Not surprisingly, the aforementioned points, badges and leaderboards are on the far left of this. As soon as you start talking about longer timescales, intrinsic motivation and the social aspects of gamification become more and more important. So why are some people so snubby about using PBL? One reason is because they represent only the first step in gamification. They can still be very useful as a tool both in the short term and the long term, but if you leave it at that, you will fail engaging the players in the long term. You will need to design better systems to continue to engage the player. A second reason is the infamous 'chocolate covered broccoli' effect. If the core activity wasn't any good, it still won't be any good with a PBL system tacked on. You need to imbue your core activity with fun and meaning. Most importantly, this has to do with general good design, which can be done with or without gamification mechanics. 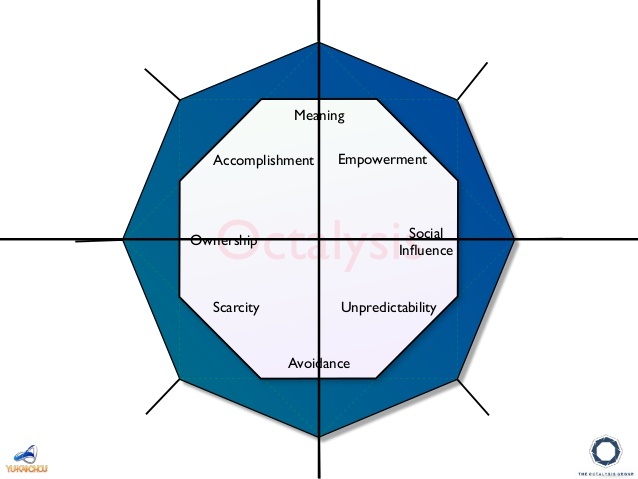 But when you look at the core drives of Octalysis, the ones that are closest to the core activity are in the quadrant of evergreen engagement: meaning, empowerment and social influence. When talking about gamification in the classroom, I usually divide it up in two parts. The gamification you do lesson to lesson, and the gamification structures you install in a chapter or a course (for an example, see my last post). These gamification structures can be awesome, providing structure, a sense of progress and a whole lot of autonomy for your students. It is in these structures that you can include PBL, and at GWC I've seen some amazing examples of systems letting you do just that. But, these structures should be the chocolate covering the ice cream of your individual lessons. Good classroom gamification is about making your lessons - your core activity - more engaging. To do this there are many many tools at your disposal. You can use games in your classroom, (online) quizzes, direct feedback, creative exercises, storytelling and much more. Or one of the most effective ways to engage: making learning a social experience through co-operation and competition. 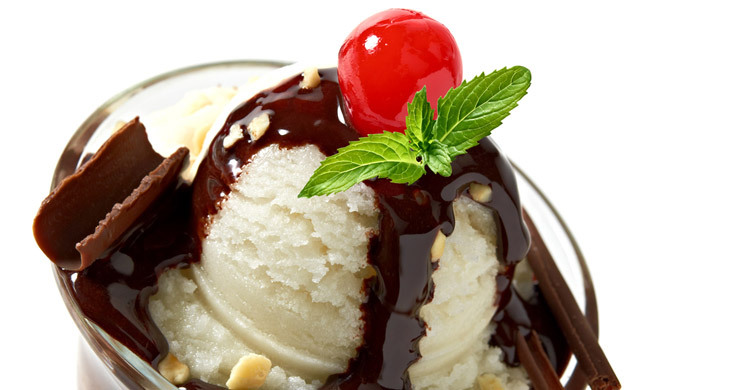 But whatever you choose to do, in the end it is about making delicious ice-cream, one lesson at a time. We believe that gamification is truly changing the way people learn and interact with each other. This blog is a space for local gamification enthusiasts to share their thoughts and knowledge on the topic. Please note that each post represents the views of that author, and does not necessarily speak for the group as a whole. Classroom gamification: conquering the world? Maybe It’s not Attention Deficit Disorder but Poor Design Habits in Academia: Can We Make Science Education and Communication More User-Friendly?